Soju is the best known liquor from Korea. It is distilled, vodka-like, rice liquor with high potency and often flavored similarly. It is smooth and clean in taste, which makes it easy to drink in combination with various Korean dishes. The main ingredient of soju is rice, almost always in combination with other ingredients such as wheat, barley, or sweet potatoes. 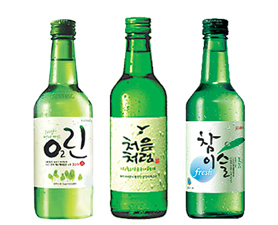 Soju is clear-colored and typically varies in alcohol content from 10% to 25% proof. It was first known to have been distilled around 1300 A.D.
Soju is the Korean equivalent of the Japanese sake. That said, Jinro is known to be the largest manufacturer of soju which recorded a sale of 70 million cases in 2004. And during that year, more than 3 billion bottles were consumed alone in South Korea! Because of its ready availability and its low price relative to other alcoholic beverages, soju has become one of the most popular alcoholic beverages in both Korea and Asian restaurants & bars offseas. Flavored sojus such as lemon, watermelon and apple are known to be popular. In addition, other alcoholic beverages that are popular from Korea are its mekjus (beers); OB, Hite, and Cass. Fact: One bottle of soju (375ml) contains 540 calories.